Next Coral Pink Sandals 5. Condition is Used. Dispatched with Royal Mail 2nd Class. Worn once for a wedding. Next Sandals Size 5, Worn Once. Condition is Used. Dispatched with Royal Mail 2nd Class. Stiletto Heeled. Size 8 Eur 42. Diamante style across toe area. Black Smart Party/Dancing. Still in original box. Never worn. COURT SHOES. LOVELY BLACK PATENT. PRICE £17.95. WITH GREAT STYLE. REAL QUALITY AND COMFORT. SOLE SURVIVOR. 2" WEDGE HEEL. Size 6.5/40. 2" Wedge Heel. NEXT PATENT LEATHER SHOES. BEIGE PATENT LEATHER. Beige patent leather with square toes. Material unknown feels like suede so have put faux suede but unsure. Buckle ankle strap. The width of sole under the toe strap is 3.25". Sole feels rubber. NEXT SNAKE Genuine Leather Heels Sandals White Size 6 1/2 UK, EU 40. EU Size: 40. Upper: 100% Leather. Insole:100% Leather/ Synthetic. UK Size: 6 1/2. Lovely,Next ladies orGirls Orange and cream shoes size 30 UK 3 1/2. Condition used,but very good condition,Please check all pictures,Also beautiful Bows With silvers,Thanks for looking,Check my other items. In as new condition, worn once inside only. Re:Style started in the hope that we could play our role in the UK consuming fashion and textiles sustainably. Re:Style fashion, instead of adding to the 300,000 tonnes of textile waste that finds its way into landfill in our country every year. Womens, NEXT. Size 6 Deep Pink high heels. Used but in good condition, there are a few black marks on the front. The are a deep pink patent shoe, with a nice heel that is in good condition. Nice for any occasion, formal or party. They have cut sections on the front due to the multiple straps up the side of the foot. 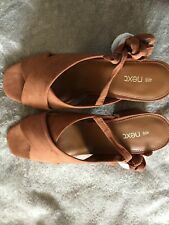 Hi You are viewing a pair of Next Burgundy Suede Heels shoes in size UK6 rrp £35.00 The shoes have never been worn (see pictures) The shoes are sold with no box or tags. I DO NOT ACCEPT RETURNS Please feel free to contact me if you require any other info. They are in a very good condition. Beautiful stiletto heels with frontal flower in Immaculate condition. Size 7 Eur 41. Strap across toe area. Black Smart Party/Dancing. Still in original box. 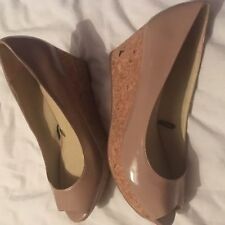 LADIES NEXT TAN SUEDE WEDGE HEELED, PEEP TOE SHOES. SIZE 6. They are in tan suede and have peep toes. They are size 6. You are looking at a lovely pair of NEXT Black Gem Embellished Cork Wedge Sandals Heels Shoes RRP £69. In good condition, very light wear to upper and outer soles. NEXT SANDALS. Label size: EU 39 UK 6 US 8.5. Next Runaway Collection: Beige Strappy Sandals Size 4. Condition is Used. Dispatched with Royal Mail 2nd Class. Next Ladies Cuban Heel Side Zip Brown Leather Ankle Boots. Type: Ankle Boots. Size: UK 4 EU 37. 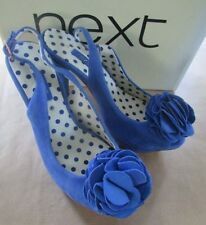 NEXT BLUE SWEDE COURT FLAT SHOES BRAND NEW. Gorgeous Next Blue Swede outer Leather inner flat court shoes. Perfect for any occasion. Sole Survivor 100% Leather. Wedge Heel Shoes. Beige Patent. Heel size 2 ins. Square Toe. Non slip sole. Heel Height In great condition as have never been worn. BY RUNAWAY COLLECTION NEXT. PARTY SHOES. NEXT brown faux leather sandle/peep toe platform heels. With a 4" high heel and a. 5" front platform. Size 37 UK 4. NEXT LADIES SIGNATURE LUXURY FIT BROWN LEATHER SHOES BNWT RRP £56 SIZE 4. SQUARE TOES WITH A STRAP OVER THE FOOT AND AN ANKLE STRAP....WOODEN LOOK HEEL. smoke and pet free home 2nd class recorded delivery. Heel height: 3.5" ( 8.9 cm ). size EU 38 UK 5. I REALIZE THAT BUYING OVER THE INTERNET ISN'T EASY AS YOU CANNOT HOLD THE PRODUCT OR TRY IT ON. Length from front to back: 8.6" ( 22 cm ). These shoes came from NEXT & only worn once. They have zip on heel and measure 4 1/4 inch. They are leather uppers and synthetic lining. They are in good condition and come with original box. Ladies Sandals. Condition is Used. Dispatched with Royal Mail 2nd Class. ADJUSTABLE ANKLE STRAP. SUEDE LEATHER SHOES. LEATHER LINED. PRICE £17.95. GREAT STYLE,COMFORT AND QUALITY. LOVELY SHOE DETAIL. By NEXT Smart navy blue suede court shoes, with soft square toe. Next "Signature" luxury fit. UK size 5 EUR size 38. These gorgeous, beige patent peeptoes by Next, are attractive and stylish. They have a 1/2" platform and a 4.25" slim but sturdy heel. They have a lovely shiny patent finish. The shoe is a court shoe and the toes are open. Op en t oe sling backshoes, black patentleather hi gh heel shoesw it h bl oc k heels. These gorgeous, black leather sandals by NEXT, are attractive and tylish. They have a T bar upper with open toes and an ankle strap. The back of the heel is covered and the 3.75" block heels give a 'glass slipper' look. Ladies Size 6 Grey 100% Leather upper Shoes vgc worn twice once indoors beautiful shoes theses are scratched and marked inside but doesn’t effect the wearing of them but thought I’d say. have a lovely christmas and happy new year.